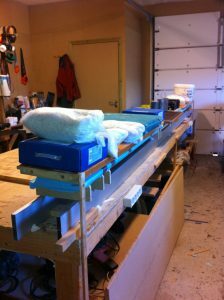 2012-05-1: This step started with making 10 jigs according to the plans (K-jigs). Made them of 12mm particle-board. Instead of using the table directly I used the two straightedges and leveled them off in both directions. 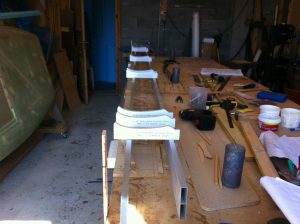 Then I bondoed the straightedge to the table, and the jigs to the straightedge. Makes a firm platform for the canard later. 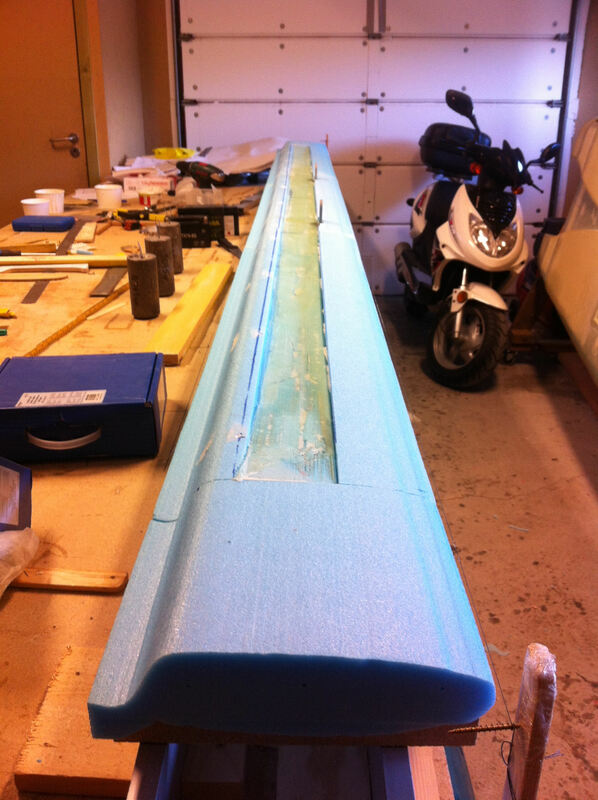 2012-05-6: I started to adjust the front part of the canard-cores to the aft-part / shear-web. Since the shear-web is thicker on the middle I had to remove some of the foam from the front cores to get a straight leading edge. I also had to remove some foam where the lift-tabs meet the front core. Then I fastened the aft part of the canard-sections with double-sided carpet-tape to the jigs instead of the 5min-epoxy. I microed the front part to the shear-web as well as the outer-cores to the rest of the canard. I used duct-tape to fasten the front-part to the aft part and weighed the whole construction thoroughly down. 2012-05-7: After removing the weights the canard reappeared in very good condition. All the cores had aligned perfect. This ends step 3.